When programming in PHP, we often have to solve problems that are already developed by others. Remember to configure our applications, connect to the database, display the templates - all of this must be programmed by yourself. It is very easy to use the framework, which contains most of the elements we need. Simply turn them on and configure them in the settings file. This allows you to start working on the system you want to program. Additionally, Yii is equipped with a module called Gii - it allows for automatic generation of elements such as controller, model or entire CRUD management systems. Using the framework we will build an application based on the MVC pattern, which will sort different elements of the application and in the future there will be no problem with finding the right fragment of the code. By using models with queries to databases, views containing page templates and controllers containing program code, we create a solution that is consistent with developers' practices all over the world. Additionally, Yii has an element called ActiveRecord, thanks to which the creation of simple queries to the database does not have to be done in the model. For this purpose it is enough to use controller where appropriate methods are used to create a query. The framework will process them on request in SQL language. Unfortunately, ActiveRecord must be used in moderation because of the resources used. This book was written to show you how to use most of the popular and most frequently used libraries. Only working with the whole system from A to Z will allow you to learn the knowledge, which after a few repetitions becomes very simple and friendly. I hope that this book will help you in programming using the Yii framework. I presented the technical side of creating applications from A to Z. I presented the framework download, ways of its installation, configuration, adding database support, I showed how to create controllers, models and views, I taught how to create components and add languages. I created this book mainly for the purpose of educating programmers for whom the pure manual available on the Yii framework website is not enough and would like to have a ready example where they can learn how to use the software itself. When I started programming, PHP version 3 was in force, where most of the functions created to manage the database, files and user-friendly URLs did not exist. Much has changed, especially in making it easier for developers programming in PHP to create new applications by enriching the interpreter itself, but also in creating programs such as the framework, which the programming of applications reduce only to creating the elements that the client wanted. Thanks to the availability of a mass of functions and methods, programming of the application becomes very easy. Instead of focusing on creating an entire application frame, the frameer allows you to create only the heart of the application. 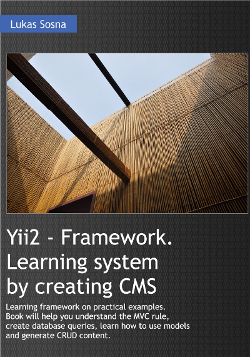 I recommend it to all people who create small CodeIgniter framework services, but if you are going to create a medium or large website, then I recommend Yii.